Summer is on us here in Florida. Have the warm temperatures come to you yet? With the hot temps all I can think about is summer sewing. 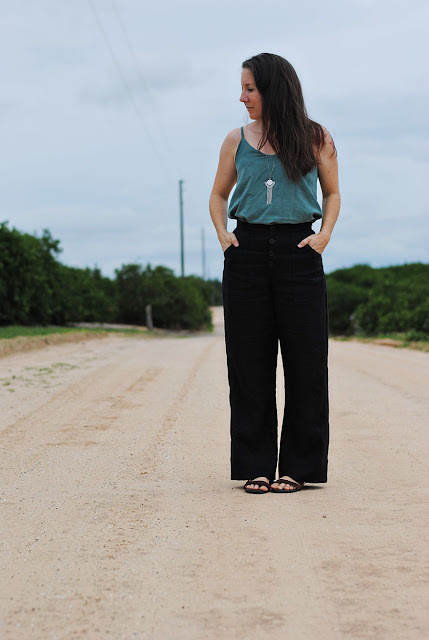 And synonymous with summer sewing is linen! 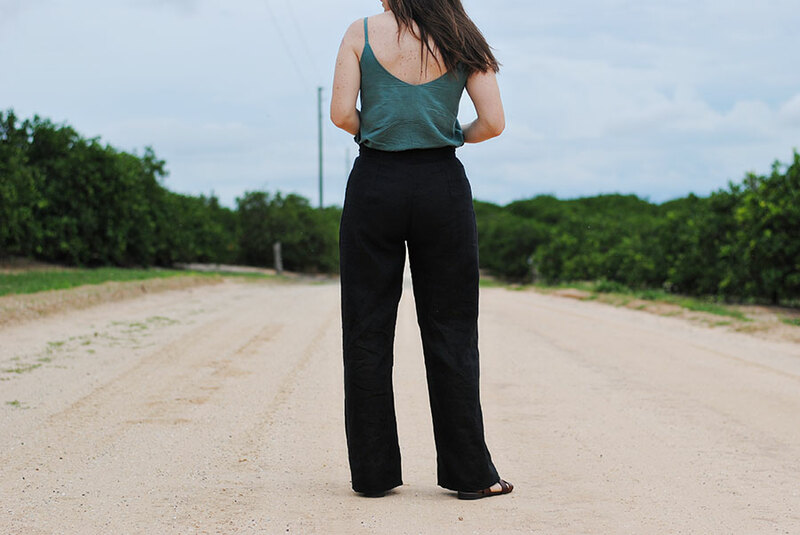 I am so excited to share these new wide leg linen pants with you! I feel like I have been hit or miss on getting pants to fit my body well, but these pants fit exactly the way I had envisioned! Before I talk about the pattern, let me tell you a bit about the fabric. Fabric Mart has a large selection of linen, and for these pants, I specifically looked at the designer quality linen. This linen is dreamy. 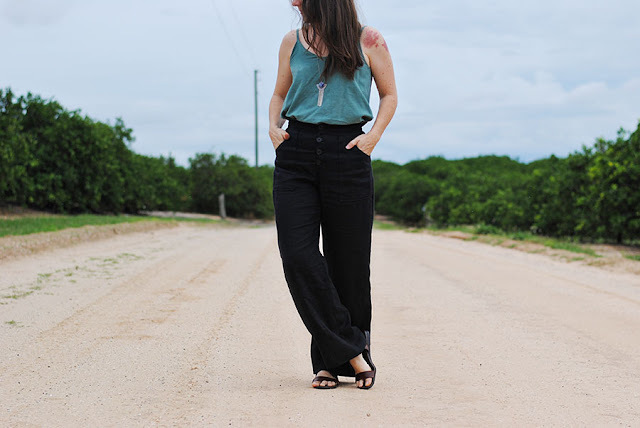 It has great drape, it is a great weight for tops or bottoms, and it is comfortable to wear! I snapped a picture of me walking to help you see the beautiful movement this fabric has! Fabric Mart no longer has the black designer linen in stock, but I love so many of the other colors, especially this Paprika! Okay, on to the pattern. These are the Lander Pants Pattern by True Bias. 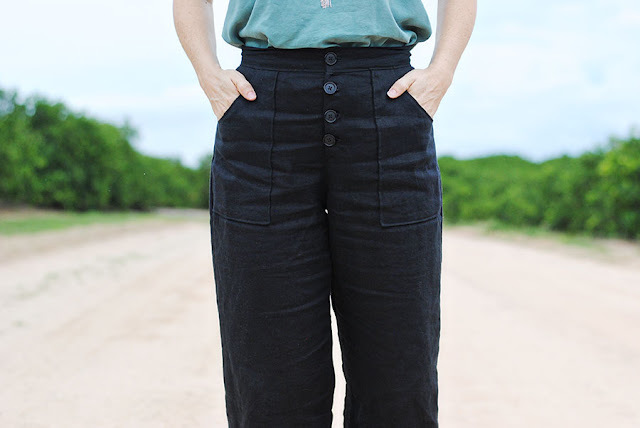 The Lander Pants is a high waist pant with an exposed button fly. 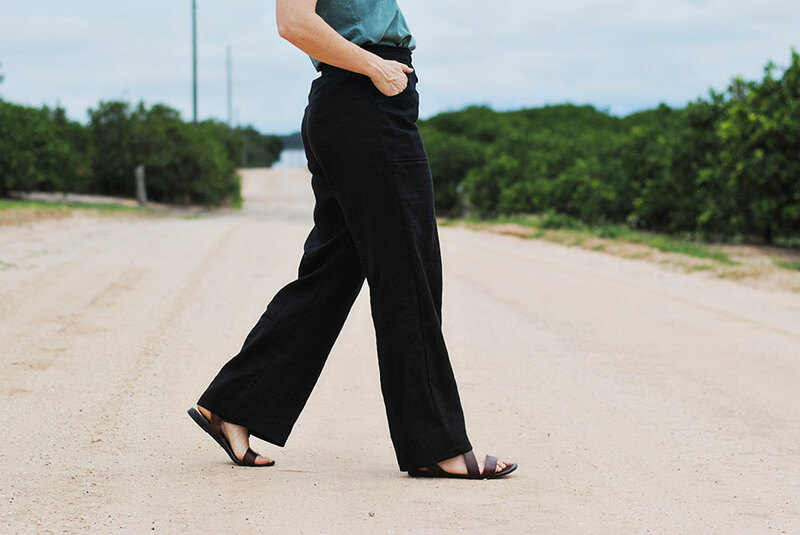 The Lander Pant Pattern is drafted with a wide 1 inch seam on the outisde seam to help with shaping. 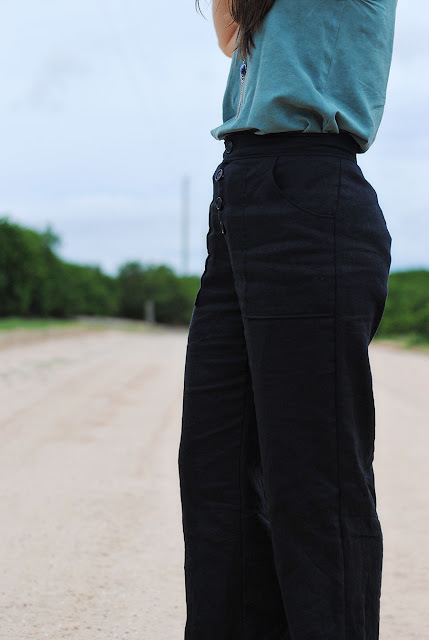 This is my third time sewing the Lander Pants, and I approached them a bit differently this time! I was looking for a wide leg, so I used 1/2 inch seam on the outside seam (instead of the 1 inch), tapered to a 1 inch seam at the waist, and I used the darts in the back to take in the waist a bit more! These are truly the most comfortable pants I own! Thank you so much Fabric Mart for the beautiful linen! I cannot wait to sew something new out of this designer linen fabric! You did a great job. I like the pockets. The fit is also good. Oh how exciting! I absolutely love this linen! And I can't wait to see your landers! Made By A Fabricista: Birthday Skirt in Red!